Continuously researching new methods allows me to reassure my patients that they are always getting the best treatment available. Dr. Mark A. Frankle has been with Florida Orthopaedic Institute since 1991. He attended Rush University College of Medicine after completing three years of undergraduate studies at Grinnell College in Iowa. Dr. Frankle completed his residency training at the University of South Florida. After residency, he completed an orthopedic pathology and orthopedic implants fellowship at Rush-Presbyterian St. Lukes Hospital. He then completed a reconstructive technique research fellowship program at the prestigious AO/ASIF Prosthetic/Implant Research and Development Complex in Davos, Switzerland. 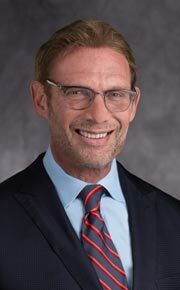 Dr. Frankle then completed an adult reconstructive surgical fellowship at the Mayo Clinic in Rochester, Minnesota. 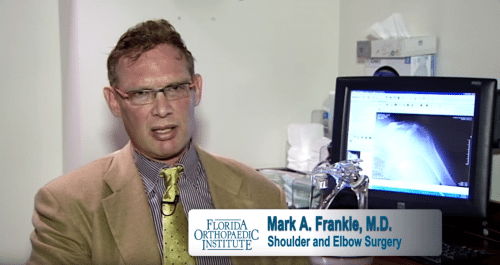 Dr. Frankle serves as the Director of the Biomechanical Shoulder and Elbow Research Lab at the University of South Florida College of Engineering and is the Director of the annual course, “Current Concepts in Shoulder and Elbow Surgery.” He has published numerous articles in professional journals and maintains ongoing research projects, presenting his work annually at various professional conferences. Dr. Frankle has designed implants and instrumentation used in shoulder replacement for several different orthopedic companies. Dr. Frankle received the prestigious Charles S. Neer Award for Basic Science from the American Academy of Orthopaedic Surgeons. Dr. Frankle is board-certified by the American Board of Orthopaedic Surgery and a member of the American Shoulder and Elbow Society. I would highly recommend Dr. Frankle. Just six weeks ago, my 80 year old father had shoulder replacement surgery and his recovery time was minimal. He doesn’t even need physical therapy. Words just can’t express how grateful we are for having a doctor that took such good care of him. The pain he was having before the dreaded surgery impacted his quality of life. He’s always been very active. Now, he can proceed with all the activities that he enjoys so much! Many thanks to Dr. Frankle and his staff an excellent job done! We couldn’t be more thankful and grateful. If I could rate 10 stars, I would. He changed my life with shoulder surgery! Dr. Frankle is a very caring doctor. I would highly recommend him and his very efficient staff. Any time Dr. Frankle’s name was mentioned as my husband’s surgeon, people were telling me that he was the best to have for his shoulder surgery. He is very well thought of. Very pleased to have found him for my husband’s reverse shoulder surgery. Very informative first post surgery visit. I was treated with respect and kindness by each member of your knowledgeable staff. My confidence about restoring my health improved as a result of this visit. Thanks to all of you. I am an orthopedic surgeon from India. I was at Florida Orthopaedic Institute on a Shoulder & Elbow Reconstruction Clinic Research Fellowship. It is a well-known fact that Dr. Frankle is a world-famous reverse shoulder replacement surgeon. He is also a designer of Encore Reverse Shoulder Prosthesis. I used to see him perform this surgery at Tampa General Hospital. He is a perfect surgeon and clinician. He would not leave the job unless it is perfectly done. I wholeheartedly recommend him for any shoulder and elbow surgery. I am thankful for him for the learning opportunity that he gave me. I have been going to Dr. Frankle for ten years. He is an excellent surgeon and I have recommended him to many people, I think that he is excellent. Anyone needing shoulder replacement surgery should see Dr. Frankle, he is the best. Incredible! Astute, articulate, empathetic, thorough, genuine are just a few of the descriptive words re: Dr Frankle. He, his associates & staff are like none I’ve ever encountered. Professional, punctual overlooking no detail, answering every question was routine operating procedure in both the hospital & office. As for my shoulder replacement, I went in terrified and 6 months later, I play golf, tennis, swim, workout, bike and sleep….peacefully & pain free! My surgery took place on my 67th Bday and it was the best gift I ever received. I was hit by a golf cart in 2013. The accident dislocated the right shoulder and tore the rotary cuff. Dr. Frankle did a reverse shoulder replacement in January 2015. In July, I am back to swimming, lawn bowling, eating with right hand, and able to raise my right hand above my right shoulder. I am thankful for his talent and skill to put me back together again. I highly recommend him. and your staff are not only very pleasant but highly efficient. Dr. Frankle took a very conservative approach of a cortisone injection in my shoulder rather than rushing to perform an arthroscopic repair which was the orthopedic opinion I received locally. My shoulder is now fine. I had a shoulder replacement procedure performed by Dr. Frankle. I was not able to sleep at night or raise my left arm above my waist. Now I am back with a new quality of life. active in golf, sleeping all night and no pain whatsoever. Dr. Frankle is an individual who was meant to be a doctor. He is thorough, considerate, friendly and takes time to explain the procedure and the follow ups and puts you at ease. I highly recommend his services.